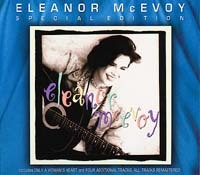 Eleanor McEvoy came to notice when her own composition "Only A Woman's Heart" inspired the title for, and appeared on, the "A Woman's Heart" anthology album. The track was re-recorded for her eponymous debut on Geffen Records in 1993. International radio hits followed with the release of the two main singles "Apologise" and "A Woman's Heart". Eleanor toured the USA, Europe and the Far East in support of the album, building up a loyal fanbase and racking up international sales. Hot Press, Irelands premier music magazine, named her Best Solo Performer in 1992 and Best Songwriter in 1993 and placed the album amongst the top debuts of that year. This reissue includes four bonus tracks.